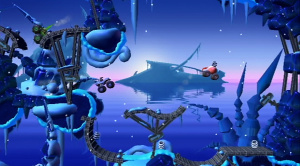 Over the past months we've brought you exclusive articles from Finnish developer RedLynx, detailing the world, characters, power-ups and vehicles on offer in the WiiWare game. Now we have the most important and final part in the series, explaining exactly how you can play MotoHeroz when it launches in August. 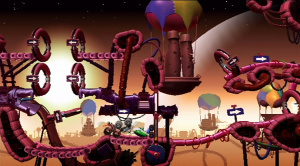 MotoHeroz features three distinct game modes, including single player, local multiplayer, and online time challenges, offering a variety of gameplay challenges above and beyond most WiiWare titles. 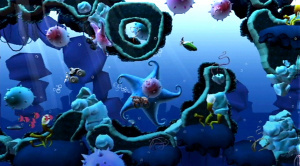 The single player mode is called Story Adventure, and it is here that you will explore a fun, colorful world with more than 80 challenging levels. You will start driving right away in the first level, jumping right in with little tutorial and simple controls. It's better down where it's wetter. The adventure begins in the World of Gema, a happy place where conflicts are resolved not by fighting but by games, especially races. Periodically, the citizens of Gema host a Great World Race to decide who will be their next leader – like an election by gamers, rule through the Leader Boards. You play as Gene McQuick, a brand new rally driver in the world of MotoHeroz. You have high hopes to win the race, but as it turns out there is a villain who is determined to defeat you. He’ll do anything to win, including cheat, and as you get deeper into the story, you will encounter many different kinds of tricks and traps he’s laid, allies he has recruited, and other dastardly feats to prevent you from winning the race. Story mode will teach you how to drive well, as well as unlock all of the game’s 14 vehicles for use in multiplayer mode. The local multiplayer mode is called Party Rally, and it is a party! 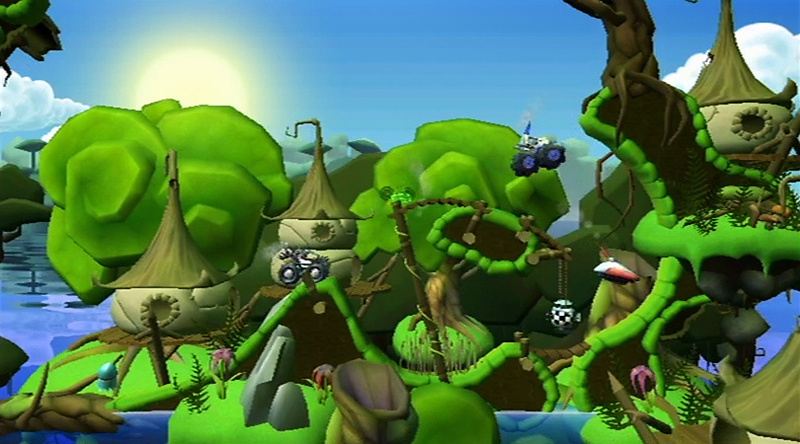 Playing on the same Wii, two to four players race along the same course: colliding, running, and jumping past each other’s buggies for total racing mayhem. The goal is to be the first one to the finish line, but hold on! Sometimes there is more than one goal, and sometimes the goal moves! Usually there is one main path through a level, but at times you can open up a shortcut or with a spectacular jump, leap to the front of the pack. Every good game needs hot air balloons. The camera tracks the movement of the lead car, and anyone who lags behind too far and disappears off the screen is brought back into the camera view. But there is a time penalty for such laggards, and every second counts! Once the first place buggy touches the goal line, a timer begins and the slower you are to reach the goal, the fewer points you’ll get for that level. There are plenty of custom options too: you can create local Profiles so you can track your victories and points over time. Or if you’d rather just jump into a Rally, you can do that too with generic Profiles. The Scoreboard between levels shows every player’s current point total, with a grand total for the Rally displayed at the end. Each Rally can be set up for one more tracks, with the players able to choose which tracks they’d like to use, or simply going with a random set. Every group of players will find a mode they are most comfortable with. Online Play is one of the more unique and ambitious game modes in a WiiWare game. You can think of it a daily, online time attack. Every 24 hours or so, a new track will open up online, giving you a fresh opportunity to climb to the top of the daily Leader Board. There’s also a global, all-time Leader Board, which tracks your overall progress. The individual events are time-based, but there is a lot of variety planned for each. In addition to featuring an ever-changing variety of tracks, the rules on each track will vary too. Some are what we call “one-shots”, which means you have only one opportunity that day to get your best time. You can of course practise the course ahead of time, but once you press the button to give it a “one-shot”, you have to do as best as you can on that track! Do NOT let your little brother in the room, or let your cat run around in front of the TV during these intense moments! The other type is called Unlimited, which will let you go after the best time for that track as many times as you like during the 12 to 24 hour period that track is over. So you can get up in the morning, record a great time, then come home from work or school and see if anyone has beat you. Finally, to make things even more fun, we have created something called Buddy Leagues. These act as filters on the global Leader Boards, so instead of having to scroll through all players in the world, you can compare your times against those of just your friends. We don’t use Friend Codes, you just need to know the name and password of your friends League to join – simply share the league names and passwords on your favorite forum or amongst your friends. It’s as easy as that. Look for MotoHeroz to release this August. Finally more info on this. Looking good so far. I like the clan thing. Saw some footage of this at a conference yesterday, looks really nice. In-depth articles like these are always very welcome. It seems that the devs have really put much thought into the game. The Online Play sounds amazing but would better fit on a (3)DS system imo. Why is wii U one of the tags? This has nothing to do with the wii U. This game looks and sounds cool but I want to know when it's coming out. sounds like the did a great effort on the online play mode.. i just wish they announced a release day. You guys have been teasing me when this game for like 4 years. I thought they´d release it in June of July but August? That´s almost the ned of my summer holidays. Well whatever, I´ll buy this anyways. wow those levels look sick. ima download this for sure. This game is looking really good. Is it me or are the downloadable games looking better then retail games as a whole this gen?